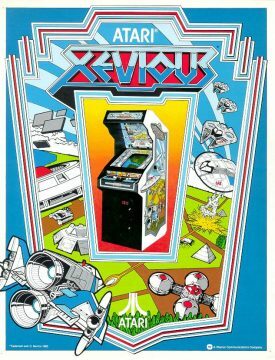 Most people reading this have probably already heard about the arcade game Xevious. Upon its release, it became an instant hit, and in the following years it was ported to many 8-bit home systems. Like with all of their successful properties, Namco keeps up the legacy with frequent reappearances on compilations and other releases. It was designed and programmed by Masanobu “EVEZOO” Endō, who graduated from Chiba university in 1959. Joining Namco in April 1981, he became one of Japan’s most respected game creators, later responsible for the equally successful Namco classic Tower of Druaga. He was one of the first programmers to take pride in referring to himself as a “game designer”. In the Atari age, programmers used to hide in-game secret messages (the term “Easter Egg” was coined in 1981, some two years after Warren Robinett hid his name within the Atari 2600 classic Adventure) to get some much-deserved credit for their work, which otherwise would have gone just to the manufacturer. It’s actually a problem the industry still struggles with – people still frequently talk about games in terms of “a Capcom game”, instead of “a game designed by Yoshiki Okamoto”. 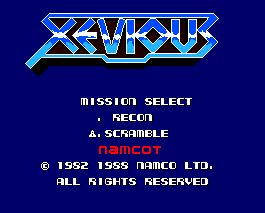 Xevious happens to contain one of these easter eggs as well, which is revealed by going to the far right and bombing away at the beginning of the game: “NAMCO ORIGINAL program by EVEZOO”. Doing the same trick in Super Xevious brings “Special thanks for you by game designer EVEZOO” onto the screen. In August 1985, Endō left Namco to found his own company, Game’s Studio. Since then he continued to work on Famicom, often in collaboration with Namco, developing successful titles like the Family Circuit racing series, or updating his own classic Druaga franchise with Kai’s Quest (Famicom), the PC Engine version of Tower of Druaga and The Blue Crystal Rod (Super Famicom). At Game’s Studio Endō designed Z Gundam Hot Scramble for Bandai, and recently he was involved with the Game Boy Color Devil Children spin-offs to Shin Megami Tensei. He was also producer for many Wizardry ports. 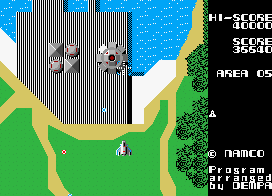 Xevious tells the story of the fight between humankind and the supercomputer GAMP, which controls the alien forces of planet Xevious. As the sci-fi cliche dictates, it turns out that the inhabitants of Xevious are originally from earth, and GAMP (General Artificial Matrix Producer) is the product of an ancient civilization that prospered on earth an hundred thousands years ago. During this golden age, the “GAMPs” were human clones used in heavy labor, until they rebelled to their own creators. In order to survive the upcoming Ice Age, they left earth and migrated in search of a new homeland, selecting seven planets which were likely suitable to human life. Right before the departure, a group of humans rebelled to them and decided to stay on earth anyway. Thousand years after the leaving of GAMPs, the brave pilot Mu and his android companion Eve decided to travel to Xevious (literally “the fourth planet”) to avoid glaciation. They don’t receive a warm welcome from their ancestors, though: captured and imprisoned, they discover that the Xevian are actually planning a massive comeback on the earth. Fast forward to our days: all above the earth’s surface, and near the remains of ancient civilizations, giant artifacts suddenly emerge from the soil and activate: they are SOL towers, buried underground and inactive for eons, now responding to GAMP’s orders: the invasion has begun. Mu, Eve and Mio Veetha, a Xevian who opposes to the GAMP’s regime and freed the duo from imprisonment, are back on earth on their ship Solvalou and ready to fight GAMP’s army. Meanwhile, archaeologists Susan Meyer and Akira Sayaka discovered that the Nazca lines could be hiding an ancient weapon which may be used to counterattack GAMP’s army. 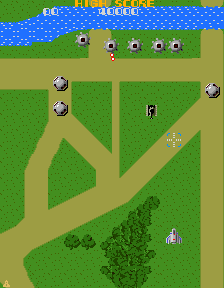 Xevious is often remembered for the many landmarks it introduced to shooters and gaming in general. 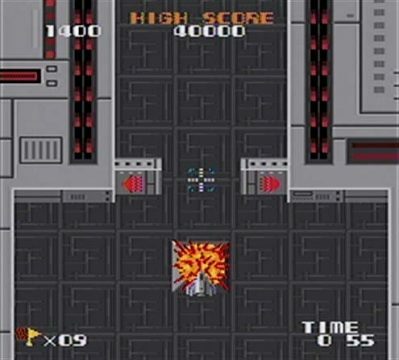 It was the first vertical scrolling shooter to feature backgrounds graphics that weren’t a simple star field. Below Solvalou, forests, rivers and plains take form. The South American setting, a landscape that eventually opens up to the famous Peruvian Nazca lines, became a classic recurrence in shoot-em-ups. The game consists of sixteen areas that play continuously, each separated by a thick forest zone. 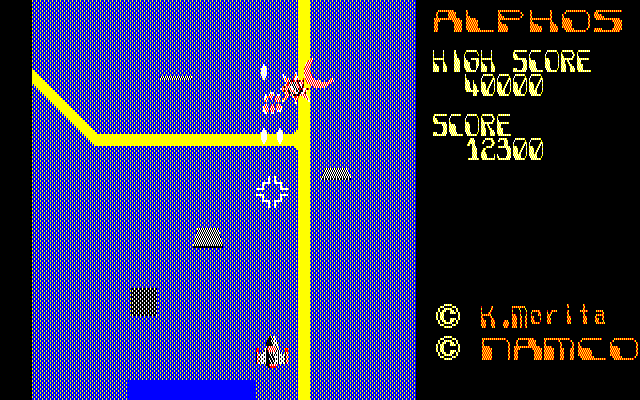 Xevious does never end (perhaps one of its less progressive aspects) and loops after the end of Area 16. 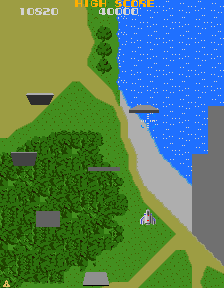 However, since most of the landscapes are recycled, a sense of deja vu creeps up well before reaching the sixteenth area; but, to the early Eighties’ gamer, Xevious offered quite a show. These environments actually played a part in the gameplay: you could figure out the pattern of a ground enemy by looking at which narrow path it would follow; destroy giant silos and other mysterious ground structures; not to mention the search for hidden towers and flags. 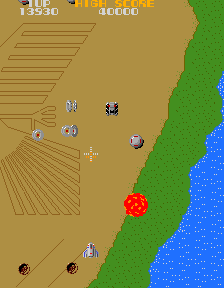 The bad guys in Xevious belong to two groups: air and ground enemies. 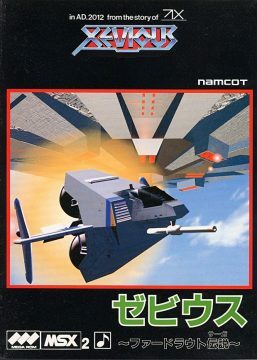 The Solvalou comes equipped with two weapons, each assigned to a button: the Zapper for air enemies, and the Blaster, bombs the ground targets with the aid of a lock-on (another feature that created a sub genre by itself, paving the way for games like TwinBee, Layer Section and Soukyugurentai). The Blaster’s crosshair always hovers a bit more than a third of the screen height above the ship and actually cannot leave the bounds of the screen. So the Solvalou can never move into the upper half of the visible playing field at any time, which at first feels very counter-intuitive, but considering that the default for shoot-em-ups so far was horizontal movement only, the conventions of how this works hadn’t exactly been established yet. The game features an impressive army of characters, as there are twenty six enemies whose unique behavior give a distinct personality. Some of them seem conceived to intentionally puzzle the player with unconventional patterns, like the floating mirror Bacura – they are immune to all the Solvalou’s weapons, so they can only be avoided. Others charmed players with their stunning animation, like the spinning Jara, or the Tarken, whose cockpit rotates while retreating. All these enemies, designed upon geometric shapes, are rendered in shades of gray decorated by pulsing red lights. They look distinctly like something that could come from outer space. It would have been possible to render each enemy in a different and extravagant color (as in many post-Galaxian shooters), but the overall impact would have been far less striking. 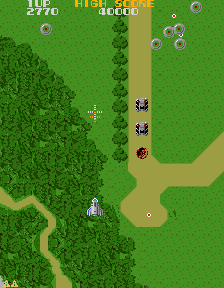 Unlike Galaxian-type games, the air vehicles that attack the Solvalou in formation don’t try to ram into it. Instead, they evade towards the screen’s sides (like the Toroid) or retreat after shooting (the Tarken). This was one of Endō’s ideas to make the game more realistic, as he thought no enemy soldier would behave so recklessly. The ground enemies generally are less of a threat. The Grobda tank for once doesn’t even shoot at the player. However, it can move rather quickly, making it hard to hit, and the score bonus for taking it down reflects that. Some of the ground targets are motionless installations and can’t harm you in any way, so they’re there solely to be bombed and earn points. The Zolbak in particular is worth a mention. Also known as “Detector Dome”, it’s an installation that collects data for the GAMP army. 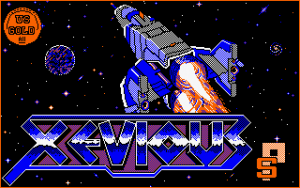 In a fashion that would be later reprised by Compile’s Zanac series, Xevious is programmed to react to the players’ behavior. When they are too proficient at killing a certain kind of enemy, the AI will send other kinds. Similarly, when the score increases, the waves of enemies intensify. Bombing a nearby Zolbak, however, reduces the enemy forces’ aggressiveness for a while, making this otherwise harmless object a priority target for survival. 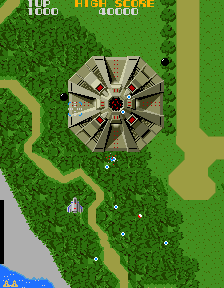 Another fine example of Xevious‘ well implemented difficulty setting is its sophisticated checkpoint system: when dying after getting through more than 70% of an area, the player gets to start the next attempt from the following checkpoint, thus reducing frustration. The massive flying fortress Andor Genesis is considered one of the first boss enemies ever in the history of video games. It announces its arrival by a rather creepy noise. Unlike any other air target, the lock-on Blaster is required to destroy it: it’s possible to aim directly to the core, or take out its other sensible spots, which is risky but rewards much more points. Or the player can just avoid its bullets and wait for it to flee away, which is cowardly but effective. The Andor Genesis is confronted four times before the game loops. 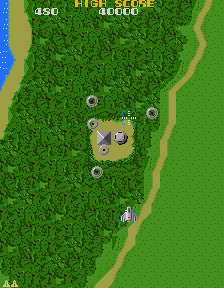 There are plenty of secrets hidden in Xevious. Sometimes the lock-on turns red as if it were targeting an enemy, even if it seems like there’s nothing on the surface below. This indicates the position of an hidden SOL tower: bombing the spot reveals it. It earns 2000 points to raise it above the ground, and another 2000 points for destroying it. Not as puzzling as these ancient artifacts, but far more precious and rare, are the Special Flags (using the very same sprite from Namco’s own Rally X). These are also hidden, only this time the lock-on won’t blink when it passes over them. So players either have to learn their location by playing the game a lot (they are randomly disposed on a set terrain strip) or just be very lucky. Revealing one adds 1000 points to the score, and grabbing it grants an extra life or 10.000 points, accordingly to the board’s settings. The importance of these little secrets in the history of video games cannot be stressed enough. They’re often the element that capture the player’s attention, thus extending the game’s life beyond the initial playthrough. It’s certainly not a coincidence that one of the most celebrated vertical shooting games in arcade’s history, Raiden DX, borrows heavily from Xevious by reprising the same concept of hidden artifacts to increase score. 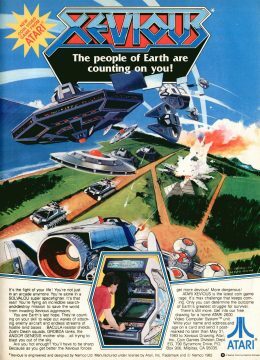 Xevious was released in the arcades in January 1983. Atari distributed it in the US, and it was the first game to be advertised by a TV commercial (Interestingly enough, Atari advertised it as: “Xevious, the arcade game you can’t play at home”). However, the real success bloomed in Japan, where the game became a massive phenomenon, spawning tons of merchandise, from boxers to model kits of the Solvalou. The game loops continuously, but the score blocks at 9.999.990. Many players were able to reach this max score, and started competitions to see who could do it the fastest. 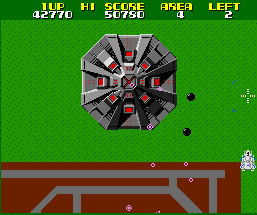 As a result of this huge popularity, Namco released Super Xevious in the arcades in 1984. It’s basically an expert course for veteran players, with much harder enemy patterns and some new characters, bringing the total count to thirty-two. The new entries are, for the most part, human vehicles such as planes or helicopters that have to be “rescued” for points, instead of shooting them. (Attacking them actually resets the score to zero!) A couple of aliens from Galaxian were added, too. 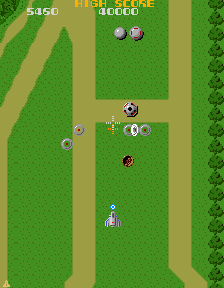 Note the tiny human tank in Super Xevious. 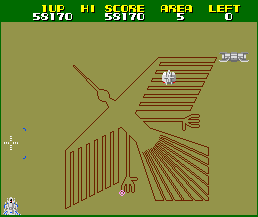 Curiously, Xevious didn’t spread onto too many consoles in its time. In Japan the Famicom had just taken off big time, and thus became the only console Namco would need. Released in 1984, it was among the very early 3rd party games for the system, and became a platinum seller. The game was re-designed to fit the 4:3 TV screen, and as a result the lock-on is closer to the Solvalou than before, which makes things somewhat trickier. Besides this, Namco, who handled the port in-house, really did an excellent job with it. It was apparently popular enough to be released again in 1990 for the Famicom Disk System. 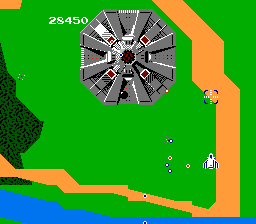 Xevious didn’t reach the American NES before 1989, leaving the market open for other efforts. 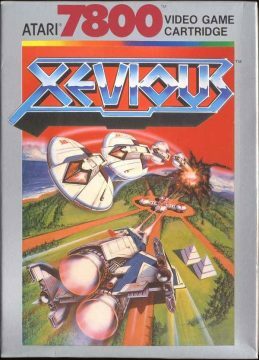 Atari planned ports of Xevious for both the 2600 and 5200: they were never officially released, but prototype ROMs can be found out there. The 2600 version is as crude as one would expect, losing most of what makes the original game memorable. It has only two enemy types, one on the ground and one in the air, and a very repetitive environment. The 5200 game contains all the major elements and even supports two-button joysticks for the two weapons, but everything moves very slowly. The stage layouts are notably different from the arcade game, and look rather boring. Finally an Atari 7800 port was eventually marketed in 1987, and while it’s a fine port for the system’s standards it went as ignored as the 7800 itself. Other than the unreleased 5200 version, both weapons are always fired together with one button, which would be true for most of the home computer ports, too. And computer ports there were many. Not necessarily the first one, but certainly the most primitive-looking was for the Sharp MZ-700, which like most games on the system is composed of custom text elements. Despite that, it is actually fairly competent and playable, although the difficulty is a bit harsh. 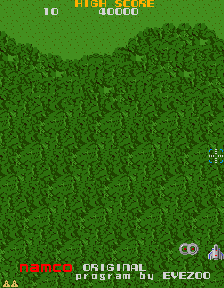 To denote its inferiority, the game is humbly titled Tiny Xevious. This name it shares with the PC-6000 versions, of which there were actually two different releases. The first one completely changes around the levels and has the cross-hair really far away from the ship, which makes it hard to hit anything with he bombs. For some reason Pac-Man and the ghosts show up in the game, and it also uses a Pac-Man symbol to show the number of lives – but only after losing one of them, as there are no on-screen displays at all during play. This was followed by Tiny Xevious mkII. This one is the real deal and a more faithful translation of the arcade game, although it is slow and very choppy. Slow and very choppy are also the keywords for the X1 and FM-7 ports, which are further spoiled by terrible non-centering controls, the lack of semi-automatic firing (so the fire button has to be pressed again for every shot) heavy flickering and in the case of the latter an ugly color palette. Most of these Japanese computer ports where made/publisheed by Dempa, although there are also a few versions by Enix, who hadn’t yet become synonymous with Dragon Quest. 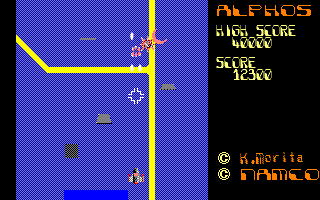 The first release was actually a Xevious clone called Alphos for PC-8801, which curiously enough still credits Namco’s copyright. This was programmed by Kazurou Morita, an extremely developer whose skilled allows for relatively smooth scrolling, a huge technical achievement for the computer. 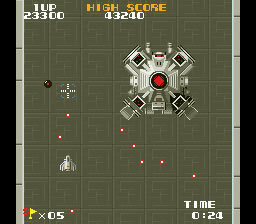 It features different stages and new graphics for most of the enemies, but it’s still very distinctly the same game. It has no background music and very sparse sound effects, but it’s fast, fluid and well-playable. Enix’ official port to the PC-8801mkIISR surprisingly is not quite as good (it was programmed by a different company, though). It may look good on still images, but in motion it has very choppy scrolling, while the sprites move fluidly enough. Sound and controls are very good, but like the FM-7 and X1 versions it lacks turbo fire, and enemy behavior seems to fluctuate more randomly than in other versions. Finally, Enix also published a version for the PC-9801, but in 1985, the current standard was everything but a suitable gaming machine. Graphics flicker heavily, the sound is very bad, and like many very early IBM PC games, the frame rate isn’t regulated, making it ridiculously fast on later systems. But even when throttling it down the pacing never seems quite right. 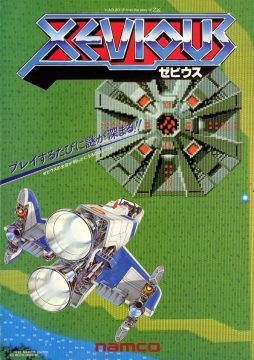 While the original version of Xevious never appeared on the MSX1 officially, the Korean company Zemina produced an unlicensed port called The Micro Xevious. It has differently composed stages, and while the scrolling is super slow, the action is super fast. It’s almost impossible to hit the Grobda before they rush off the screen, and enemies always attack in vicious formations and from all sides, including behind. To compensate, however, the player gets seven lives and always respawns at the spot after dying. The Andor Genesis is just a ground installation in this version and can be easily passed by. Aside from the original 1-second bleep loop from the arcade, it also offers a second BGM, which is a neat little melody but hardly fits the action on screen. The MSX2 was served in a more official capacity, outsourced to Compile, famous for many excellent shoot-em-ups on the system. There’s not much to say here, except that it controls very smoothly, and it overcomes the scrolling issues that are prevalent in shooters on home computers. After all, this is Compile we’re talking about. 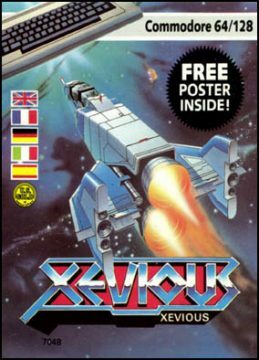 In fact, this one ranks among the best shoot-em-ups available for the MSX2, and certainly the best Xevious available on home computers. 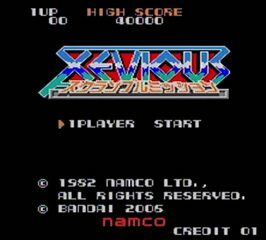 Titled Xevious: Fardraut Saga, it also includes a completely new playing mode, which is covered in detail in a separate entry. The only US-made computer port was for the Apple II, which strays a but further from the original with the stage layouts, but isn’t too bad considering the technical limitations on one of the oldest home computers. 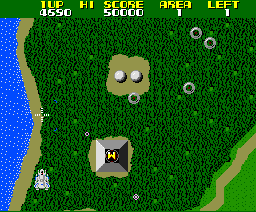 In Europe, U.S. Gold secured the Xevious license, and brought it to all the popular systems. Most of these were programmed by Probe Sofware. 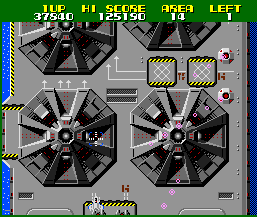 Like most other computer ports, the Amstrad CPC version uses one button for both weapons, but only the bombs are fired in semi-automatic mode. The stages have been modified again, and now every segment is really long, slow and boring. The ZX Spectrum port has the same stages as the CPC, but runs much faster and more fluid. The improved performance is bought with the typical monochrome playing field, though. The Commodore 64 port seems to have not been programmed by Probe, but it’s also quite bad, mostly for its very sketchy hit detection. Probe Software also made a conversion for the Atari ST, which has very obnoxious sound effects, but otherwise is very faithful to the arcade game. 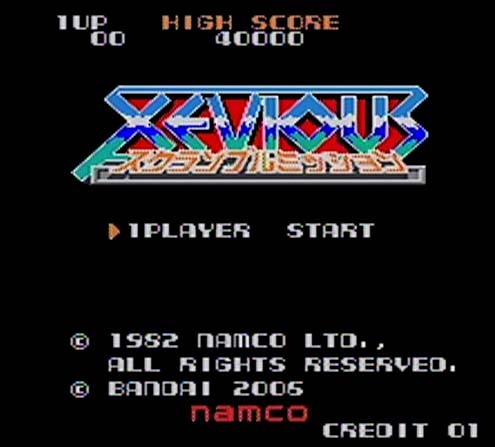 Xevious can be found in Namco Museum Volume 2 for the PlayStation, and it was also included on Xevious 3D/G for the system. Both packs include the original as well as Super Xevious. Both offer several display options, including tate mode for screens that can be turned to the side, which then use the full arcade resolution. 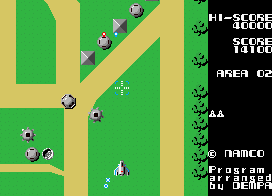 Although Namco released the Namco Museum series to a great variety of platforms, Xevious was initially not among the most frequently re-released games. It is included in Namco Museum: 50th Anniversary for PlayStation 2, Xbox, GameCube and Windows PCs (but missing on the Game Boy Advance compilation of he same name), Namco Museum Remixfor Wii, Namco Museum Virtual Arcade for Xbox 360, and the download-only Namco Museum Essentials for PS3. On portables, it appears on the Western version of PSP’s Namco Museum Battle Collection, as well as Namco Museum DS. The latter has a terribly flickering horizontal display mode, but thankfully a much better vertical mode is available as well, which only adds some horizontal scrolling because the stages don’t quite fit on the screen. 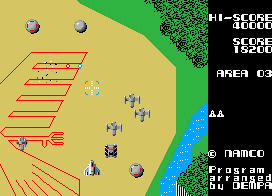 For some reason the original Xevious can also be unlocked in Namco’s Starfox Assault for GameCube. For the 3DS eShop, it was retouched at part of the 3D Classics line, adding depth between ground and air elements and moving clouds at the sides of the screen. The NES version reappeared for the Game Boy Advance, as part of the NES Classic series. Since the GBA screen is even wider than the 4:3, the graphics appear a bit squished, but it’s a decent transfer and still doesn’t look too bad. The Virtual Console downloads on Wii and WiiU are also based on the NES version. Namco also released a bunch of mobile versions, most of which remained exclusive to Japan. The first appeared in 2002 for Sharp’s J-SH51, and was accompanied by a downgraded, arranged version for regular Java based phones called Mini Xevious, which uses a zoomed-in view in place of the downscaled one in the regular version. In 2010, there was a new version for EZweb and Yahoo! phones, which featured redrawn graphics and new effects like hovering clouds and a “WARNING!” label when the Andor Genesis appears, as well as a few additional play modes. The next year, it was followed by the iOS version of Namco Museum. 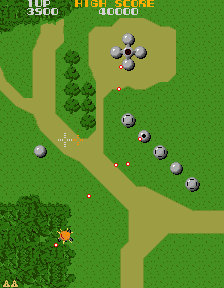 In 2001, Xevious also became the headlining game for Sharp’s Zaurus PDAs. Finally, Xevious has also been on several TV plug & play standalone compilation devices, including Namco Ms. Pac-Man Plug & Play with 5 TV Games, Retro Arcade Featuring Pac-Man and Namconostalgia 1. 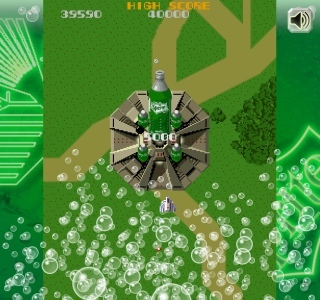 In 2012, Coca Cola in Japan published a Flash-based browser version of Xevious on its homepage as a promotion for Sprite, named Sprite x Xevious. It’s mostly an exact copy of the arcade games, but occasionally Coca Cola bottle caps or Sprite bottles appear and can be popped open for bonus points. 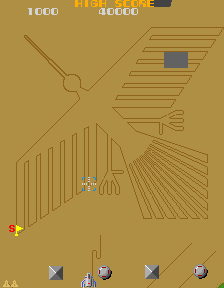 The Nazca lines have also been replaced with a Sprite logo in the desert. 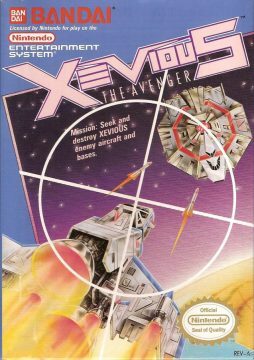 It’s the easiest version of Xevious, as the Zapper is locked in constant auto fire and the player has unlimited lives, but it ends after shooting down the first Andor Genesis. The game has since been taken down from the site, but can still be played in the Internet Archive. Namconostalgia: Let’s! TV play Classic is a series of plug&play game-system-in-a-controller devices, each of which comes with two classic Namco games and new rearranged versions of the same. 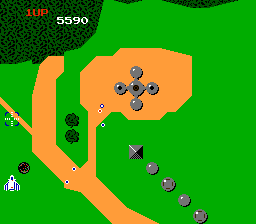 Xevious was accompanied by Scramble Mission, which is not the same as the PC Engine version mode, but mostly a series of techno corridors where more weight lies on evading obstacles.